If you’re looking into buying a bird hunting dog, there are some things you should watch out for. Although there are many breeds of dog that are good for a bird hunt, that doesn’t mean that any dog of that breed would do a would be good at it. There are a lot of factors to consider when choosing the right breed. All of these things should be looked at when you meet with a breeder. Speaking of hunting dog breeders, you should always buy the dog this way. Although it may be a bit cheaper to get a dog from someone who isn’t qualified, you won’t know what you are getting. Breeders are a bit more reliable as far as bird hunting dogs go. Don’t think that all breeders are good, though. There are certain things that you should check before purchasing a dog. Firstly, find out about the dog’s heritage. The dogs that parented the dog you’re looking at should have also been bird hunters. Have the perspective dog’s temperament checked as well. If you have small children in your home, the dog should be safe to be around them during off hours. They should also be very obedient. When you go to the breeder to meet the dog, play with him and do some tests. See if it responds to your commands. The best thing about a hunting dog is their utility. 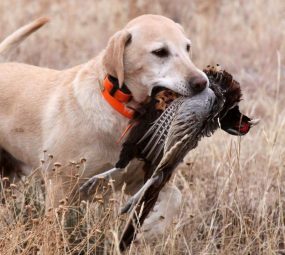 An upland game dog will retrieve the bird that you felled with your gun. This can make things a lot easier because most areas that are great for bird hunts are lands with many marshes. It’s easier for dogs to maneuver through this kind of area. That’s why it’s important to test the dog before purchasing it. Have it fetch something in an area with a lot of distractions. All dogs are great with fetching, but bird hunting dogs are better because they can find the bird in a confusing area. Another really important thing to learn about the dog is whether or not it has had its relevant shots and immunizations. You need them to be healthy and able to hunt with you. The breeder should have documentation on this. If they don’t, then go to a different breeder. Also check if the breeder themselves are certified. Some people claim to be breeders but aren’t recognized by the state. It’s better to stay away from these people. If you keep all these things in mind, you’ll be able to find a bird hunting dog that does a great job for you.